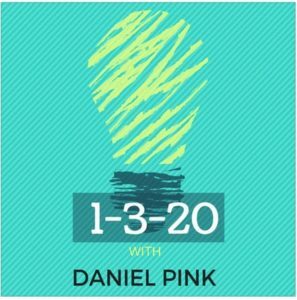 I don’t know if you’ve heard of it, but the 1-3-20 podcast with Daniel Pink is out there, it’s free, and it’s just plain awesome. That’s where the 1, 3 and 20 come from. He goes after one big idea (the premise of the author’s book), asks three key questions (What’s the big idea, why should I care, what can I do about it) and get through the interview in under twenty minutes. In just the first nine episodes, Dan has landed some big names. Some I’ve read before and some I hadn’t heard of yet. He recently interviewed Tom Peters (from In Search of Excellence fame) about his new book, The Excellence Dividend: Meeting the Tech Tide with Work That Wows and Jobs That Last. The book was just released April 3rd, and the podcast is from April 9th. When I met author Whitney Johnson (see that blog post here) in June, I happened to ask her if she knew Dan Pink. “Yes,” she replied, “I was just interviewed on his podcast!” Wow! What a crazy coincidence! But then I’m not shocked. I can see why Dan thinks her book is worth the interview. I can’t wait until that podcast gets released. If you like Dan Pink, like learning about great books before reading them or just need to fill your next 20-minute commute with some useful content, go grab Dan Pink’s 1-3-20 podcast wherever you get your podcasts. If you’re not sure where to look, and you’re easily confused by google, check here on hubspot.